Blue beat, as a music term, seems to have fallen by the wayside, but in the 1960s its use in England, and later in the U.S., served as a way to describe Jamaican ska, the island nation's hottest musical trend of that decade. Harry Belafonte had been largely responsible for calypso, a traditional music of Trinidad, reaching a massive worldwide audience in 1956 and '57 with his top-selling Calypso album, cementing its connection to Jamaica with the hits "Jamaica Farewell" and "Banana Boat (Day-O)," the latter a song that originated in Jamaica. Mento, a Jamaican take on calypso expression, began to evolve in the late '50s with recordings by Kingston producer Coxsone Dodd and others, as musicians, attracted to American jazz and R&B, found ways to mix those styles with the more traditional Antilles rhythms, leaning heavy on bass and brass, the result identified at some point as ska. 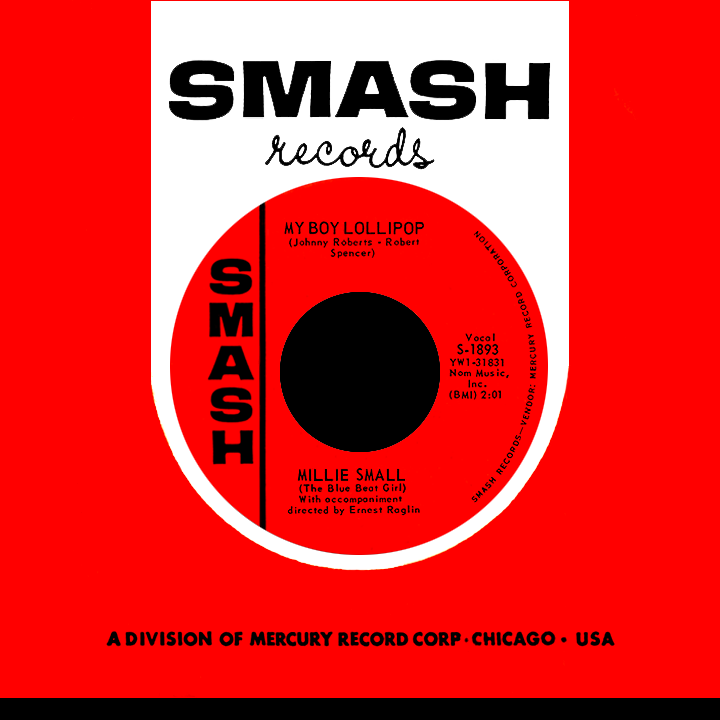 British music producers called it "blue beat" while those of us in the U.S. were blissfully clueless about the whole thing...until 1964, when Millie Small came seemingly out of nowhere with "My Boy Lollipop." The song itself was as American as its gets; first recorded in 1956 by New York teenager Barbie Gaye, it was written by Bobby Spencer (later a member of The Cadillacs) and Johnny Roberts (a fringe record industry guy who managed The Cleftones for a time). Originally titled "My Boy Lollypop," it was released on the obscure Darl label. Gaye's performance was undisciplined and somewhat amateurish; despite this, Alan Freed played the song on his WINS radio show and booked her for his star-studded 1956 Christmas show at New York's Paramount Theater. The record failed to connect on a national level but was not without admirers, reaching a few appreciative ears in the U.K., while in the Big Apple, budding singer and future songwriting legend Ellie Greenwich was a fan. Her first single, "Cha-Cha Charming," was released on RCA Victor in the spring of 1958 under the name Ellie Gaye, avoiding the possibility that her real last name would be mispronounced (which, of course, didn't matter in the long run). The singer who eventually made the respelled "My Boy Lollipop" a worldwide multi-million seller was about 12 (possibly a year or two older) as the 1960s began; born Millicent Dolly May Small and raised in the southern Jamaican parish of Clarendon, the five-foot-three singing hopeful won a Jamaicawide talent contest held annually by radio personality Vere Johns; winners often wound up making records at Coxsone's studio in the capital city of Kingston, and so it was for young Millie, who had a big local hit, "We'll Meet," with Roy Panton (as Roy and Millie) and served as glorified harmony partner on a nonetheless infectious duet, "Sugar Plum," with local star Owen Gray (as Owen and Millie). The naturally high-pitched timbre of her voice became far more obvious when she emerged as a solo act. The London-born founder of Island Records, Chris Blackwell, was raised in Jamaica, his roots firmly planted in the music of the area. He recognized Millie as potentially marketable and took her to England in late 1963, enrolling her in the Italia Conti Academy of Theatre Arts in London to improve her diction, dancing and stage skills; she then recorded "Don't You Know" (a pop song she penned with Tony Thomas), her debut disc on Fontana Records using the abbreviated name Millie, same as on the earlier duets. "My Boy Lollipop" came next, breaking into the U.K. charts in April '64 at the same time she appeared in the ITV special Around the Beatles, a coup for anyone seeking exposure to a large audience; a month later the single hit number two (behind "Juliet" by The Four Pennies), prompting Mercury Records to follow suit, releasing it stateside on its Fontana subsidiary, then switching to the Smash label and billing her as Millie Small (The Blue Beat Girl). Many westerners didn't grasp, or even notice, the uniqueness of this music Millie was pushing, its sound having no basis for comparison with anything that had come before. But even if some considered it a novelty, who cared? They liked it! The record duplicated its British success by achieving a number two U.S. peak in July (the week The Beach Boys topped the chart for the first time with "I Get Around"). The liner notes of Small's American album mentioned she was 16, putting her birthdate at October 8, 1948 (which would have actually made her 15) and referred to "blue beat" as a dance as well as a style of music. Just as "Lollipop" peaked, Jamaican group The Ska Kings (Byron Lee's band originally known as The Dragonaires) appeared on the U.S. chart with "Jamaica Ska," positioning it as a dance while establishing this hot new ariose obsession from the Caribbean. In England, Millie was in Swinging U.K., a short film shown in theaters that summer featuring the Four Pennies and other rookie acts. She appeared in a Belgian film, Variétéprogramma ("Variety Show" in English), as a singer, billed as Millicent Small, the name she planned to use in her acting career. That career essentially began and ended with her role in The Rise and Fall of Nellie Brown, an episode of Britain's ITV Play of the Week broadcast in December 1964. Her only other onscreen appearances were on TV music shows in England as well as the U.S.-based Hollywood a Go Go and Shindig. Millie's follow-up single, "Sweet William" (written by American pop composers Philip Springer and Buddy Kaye), had a nice run, making the top 40 in both the U.K. and U.S. Two further 45s (including "Don't You Know" a year after its original release) didn't fare nearly as well; then there was a very un-ska-like Christmas song on Atlantic, "I've Fallen in Love with a Snowman." She landed on the U.K. charts one last time, in November '65, with a remake of Wynonie Harris's 1951 R&B hit "Bloodshot Eyes." Along the way she adapted songs by U.S. stars like Chuck Willis, Sam Cooke, Marv Johnson and Bill Haley to the blue beat style, continuing to make records for British labels Fontana, Island and Decca. Later recordings include "Killer Joe" (the Rocky Fellers hit from 1963, an obvious choice for Millie's high vocal range) and an entire album of Fats Domino tunes (she loved the Fat Man...who doesn't?) before fading from the music scene in the mid-'70s. Early on she said her main ambition was to earn enough money to buy a big house in England so her family could move from Jamaica; that modest goal was easily realized. More significantly, as the ska music she exposed to millions of people far beyond the confines of the Jamaican isle evolved into the phenomenon called reggae, Millie Small's role in its formation came to be recognized as an important one. Way Back Attack trademark and content Michael Jack Kirby. All rights reserved.